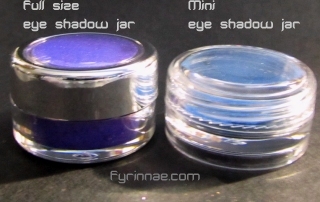 (the Arcane Magic shades are not listed here) About Fyrinnae eyeshadows: Our loose shadows are not dry powder, but contain synthetic oil and other ingredients which cause them to appear clumpy or sometimes form tiny (easily used as-is or crushed) balls of shadow. They are supposed to look and feel this way. The inclusion of these ingredients often lends to richer color and longer wear, and helps reduce fallout during application. Eye Shadow Ingredients:Mica, Cyclopentasiloxane, Isododecane, Styrene/PVP Copolymer, Myristyl Myristate. May contain: Iron Oxides, Titanium Dioxide, Manganese Violet, Tin Oxide, Ultramarines, Chromium Oxide, Copper Powder, Bronze Powder, Calcium Aluminum Borosilicate, Magnesium Myristate,Blue #1, Red #40, Yellow #5, Synthetic Fluorphlogopite, Ferric Ferrocyanide, Silica.